How does the water chemistry around coastal oyster and seagrass beds in Tampa Bay connect to the water chemistry 70 miles offshore, where corals might lie deep below the surface? A collaborative team of scientists set out to start answering this question, installing new acidification sensors to an existing buoy. Increases in atmospheric carbon dioxide (CO2), coastal eutrophication, upwelling, and freshwater run-off from land to sea are all processes that can increase the concentration of CO2 in coastal and ocean water. This increase in CO2 can decrease the pH of the seawater causing acidification. How the different coastal and ocean processes contribute to changing seawater chemistry is complex and monitoring helps us to untangle different causes and consequences of these changes. In the last year, scientists tripled their acidification monitoring stations in the Gulf of Mexico- from one to three continuous monitoring systems! Under the direction of Dr. Kim Yates (USGS), her team deployed an Ocean Carbon System (OCS) to measure pH and pCO2 in the dynamic estuarine and nearshore waters of Tampa Bay. This system can help us understand the influence of freshwater and nutrient runoff on acidification but until now, it was challenging to know how coastal carbon chemistry was connected to chemistry of the deep ocean. Through a collaboration with University of South Florida (USF) physical oceanographer Dr. Bob Weisberg, a new carbon system has been integrated and deployed on an existing SECOORA buoy at 50-meters on the west Florida shelf. 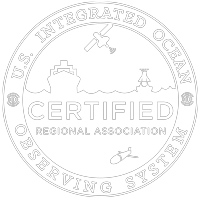 As part of SECOORA, USF Coastal Ocean Monitoring and Prediction System (COMPS) maintains a number of moored stations on the West Florida Shelf. COMPS buoys provide an ideal platform for filling an ocean acidification measurement gap. The new acidification sensors were integrated into the COMPS C12 buoy located 70 nautical miles offshore of Tampa Bay. This new suite of sensors provides real-time measurements to connect the dots between the Tampa Bay monitoring system and what happens offshore. The rapid systems engineering, testing and deployment of this OA sensor suite was made possible through effective collaboration between USGS and USF scientists, engineers, technicians and machinists. Engineers at USF integrated the sensor package that Dr. Yates developed onto the existing COMPs buoy system. The USF machine shop made a custom bracket to allow for maintenance and replacement of the sensors while out at sea. Computer engineers then integrated the new data into the existing data stream so that scientists (and you!) can access real-time data on the COMPS website (LINK). Working together, the USF and USGS teams performed testing in both the lab and on a dock close to shore before executing the final deployment. Pictured are the team members from the project. Stay tuned as the collaboration is continuing! The researchers are looking to expand observations to other locations on the west Florida shelf.